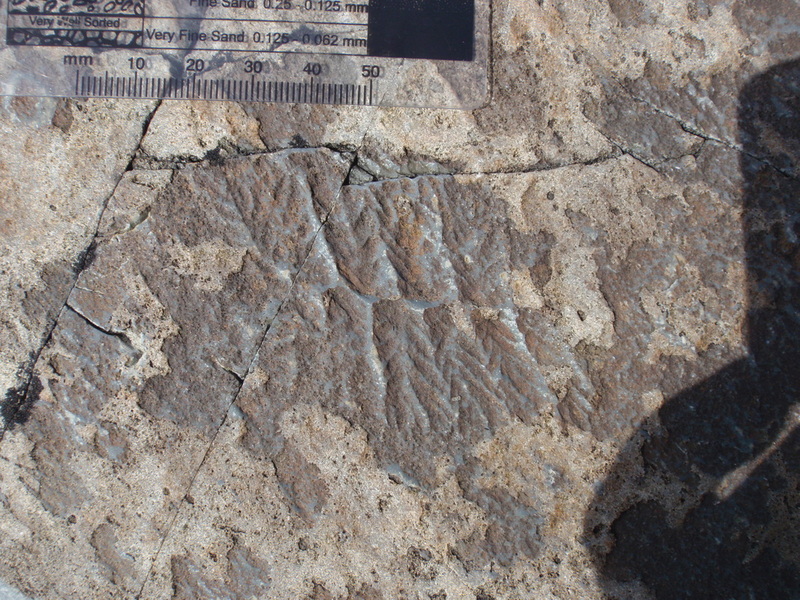 Fractofusus misrai from the 'E' Surface of Mistaken Point Ecological Reserve, Newfoundland, Canada. Fractofusus, originally described as the 'spindle organism', is one of the most common rangeomorphs in fossil assemblages from Newfoundland. Two species have been described, distinguished by their overall morphology and number of branches. F. misrai and F. andersoni are rarely found alongside one-another, but they exhibit some interesting patterns of distribution. Although they are reasonably common on bedding planes from the Briscal to Trepassey formations of Newfoundland, they have never been reported from contemporary (and palaeogeographically proximal) sections in the U.K. (Wilby et al., 2011). Furthermore, when they are seen in Newfoundland, Fractofusus specimens are either very rare components of the assemblage, or they are the numerically dominant taxon; on the 'E' Surface for example, over 25% of the ~4000 organisms are F. misrai. Fractofusus is considered to have lain flat on the seafloor in life. This suggestion has been made on the basis of the often excellent preservation of the lower surface of the specimens (suggesting they were already in contact with the sediment), and the lack of alignment of the fossils on bedding surfaces (which, along with a lack of evidence for an anchoring structure, suggests that Fractofusus was not elevated into the water column; Gehling & Narbonne, 2007). There has been considerable discussion about whether or not Fractofusus possessed two or more 'vanes' (i.e. rows of rangeomorph bundles). Only two vanes have ever been observed from the many 1000s of specimens in Newfoundland, but it has been suggested that it makes little sense for an organism to have such high surface area permanently in contact with the seafloor (e.g. Dufour & McIlroy, 2016), and therefore Fractofusus may have had additional vanes elevated into the water column (Gehling & Narbonne, 2007). A single specimen from NW Canada, suggested to be a Fractofusus, has been reported to exhibit evidence for a third vane (Narbonne et al., 2014), but this interpretation remains to be validated by the discovery of additional specimens. Fractofusus andersoni is a bipolar rangeomorph known only from Newfoundland, Canada, and from a single specimen from NW Canada. In contrast to the thinner, longer Fractofusus misrai, F. andersoni is relatively short and fat, but displays the classic zig-zag midline typical of the genus, and displayed rangeomorph branches. 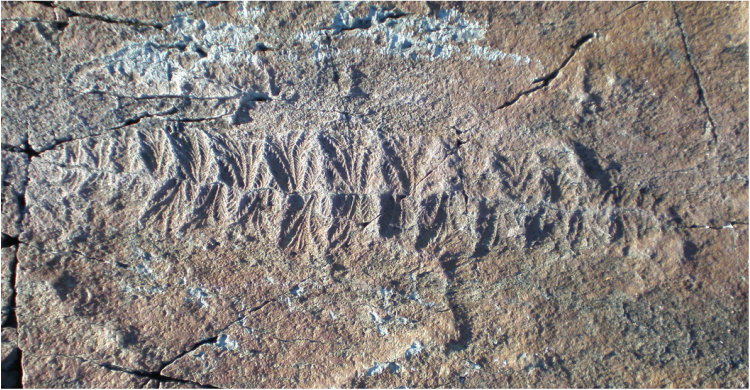 The two Fractofusus species were named after the first researchers to describe Ediacaran macrofossils in Newfoundland: Shiva Balak Misra, and Michael Anderson (Gehling & Narbonne, 2007). Fractofusus is one of the most abundant rangeomorphs in Newfoundland, and has a stratigraphic range that spans the Briscal to Fermeuse formations. Some beds contain 1000s of Fractofusus, which are assumed to have lived immobile lives lying on the seafloor. These assumptions, if correct, mean that their positions on bedding surfaces should reflect their original positions during life, making it possible to study spatial patterns amongst the palaeocommunities and infer information about their original ecology. Mitchell et al. (2015) assessed Fractofusus distributions on three bedding planes where they are abundant, and recognised that rather than having a random distribution, the specimens appear to be arranged in 'clusters' and also 'clusters of clusters'. When the size of individuals was also taken into account, it was evident that the smaller specimens were clustering around larger ones. These observations were interpreted to suggest that Fractofusus reproduced via a two-stage reproductive strategy: first colonising the seabed by being washed in as water-bourne 'propagules', and then utilising a 'stolon-like' reproductive strategy, producing the clustering patterns evident in their spatial positions today (Mitchell et al., 2015). Fractofusus andersoni from the H14 surface of the Bonavista Peninsula, Newfoundland. Fractofusus with 13 or fewer modules in each vane; ovate, with length typically less than two times width. Outline of each module expanding slightly from the commissure toward the distal margin of vane. Each module exhibiting a single, principal pinnate frondlet with no evidence of subsidiary frondlets. Modules inclined at <90 degrees to commissure of either side of central module; distal ends straight. Fractofusus misrai is the 'long and thin' variant of Fractofusus, diagnosed as possessing 15 or more rangeomorph branching bundles that each emerge from a central, irregularly alternating axis. Owing to their preservation as negative impressions on the seafloor, they are often amongst the most well-preserved of any Ediacaran fossils. The rangeomorph bundles get smaller towards both ends of the organism, suggesting that it grew in a bipolar fashion. It has been suggested that each branch bundle comprises one principal branch surrounded by asymmetrical subsidiary branches that may or may not appear during the growth of the organism (Gehling & Narbonne, 2007). A close-up image of a rangeomorph branching bundle within Fractofusus misrai. 'E' Surface, Mistaken Point Ecological Reserve, Newfoundland. Fractofusus with elongate body; length more than three times width. Vanes constructed from 15 or more modules; adjoining sides of each module nearly parallel-sided, and typically including a central, obovate to triangular principal frondlet, adjoined on both sides by subsidiary frondlets close to the commissure. Distal ends of modules somewhat spatulate.